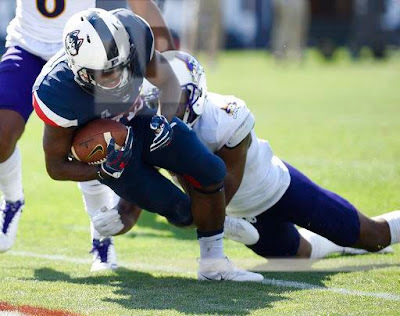 If UConn headed into Saturday's conference road opener against SMU with a 3-0 record, there would be much more chatter about what a difference new offensive coordinator Rhett Lashlee has made. In the previous five seasons UConn ranked 122nd, 124th, 126th, 114th and 113th in total offense. The Huskies are ranked 24th this season. The Huskies have gone from averaging 320 yards of total offense in 2016 to 489.3 in the first three games. Only UCLA, which improved its total offense mark by 192 yards from a season ago, has seen a larger jump in the last 12 months than the Huskies.Another number to chew on is that the Huskies had 369 yards of total offense in the second half against ECU which is more than UConn managed in four quarters of football in 54 of 73 games from 2011-16. Some of the improved offensive production is out of desperation with the defense ranking dead last among FBS teams in passing defense and 127th out of 130th in total defense. Still, it's hard to argue with these offensive numbers. SMU also ranks among the national leaders in terms of offensive improvement.